Bill Henard is senior pastor of Porter Memorial Baptist Church in Lexington, Kentucky. He is also president of the Kentucky Baptist Convention, former trustee chairman for LifeWay Christian Resources, and assistant professor of Evangelism and Church Growth at Southern Baptist Theological Seminary. Henard and his wife, Judy, have three children and two grandchildren. 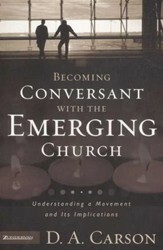 Adam Greenway is assistant professor of Evangelism and Applied Apologetics and associate vice president for Extension Education and Applied Ministries at Southern Baptist Theological Seminary in Louisville, Kentucky. 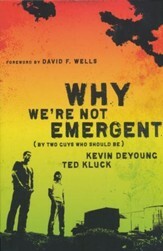 He also directs Research Doctoral Studies at the seminary’s Billy Graham School of Missions, Evangelism and Church Growth. 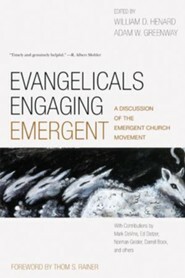 I'm the author/artist and I want to review Evangelicals Engaging Emergent: A Discussion of the Emergent Church Movement.